The popular Quaife Automatic Torque-Biasing LSD is now available and in stock for various Mercedes C and E class models, exclusively at Birds. 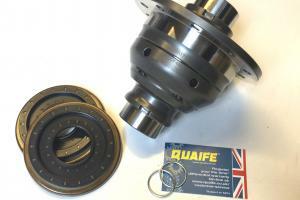 Once installed, drivers will notice an immediate difference as the Quaife ATB automatically biases torque across the axle to the wheel with most grip. Unwanted wheel-slip is greatly reduced, enabling drivers to exploit the full potential of their Mercedes for the first time. All standard Mercedes cars come from the factory fitted with an "open differential" - a simple device that allows the driving wheels to turn at different speeds. The problem with the open diff is that it can only ever apply the same amount of torque to both driving wheels, so when a wheel slips, it will only put through the amount of torque it requires to power that spinning wheel (very little!). Additionally, Mercedes use various electronic systems that "curb" power to the drive wheels during traction loss (indicated by the flashing traction light on your dashboard). The Quaife ATB (auto torque-biasing) limited-slip differential is the ultimate traction solution. Its patented gear-based design allows a progressive transfer of torque away from the spinning wheel and onto the wheel with more grip. Unlike conventional LSDs, it does not use clutches or other wearing internals, meaning that Quaife can give a limited lifetime warranty on their units, which requires no servicing or maintenance. It is completely silent in operation and works perfectly with the car's electronics. This application fits the models listed: C36 AMG, E36 AMG, and CLK430. To celebrate 10 years of selling Mercedes Quaife ATB differentials, we're offering a special discount for all Mercedes models that we have Quaifes available for, subject to stock and for the months of June and July 2018. With the release of this Quaife application, this can now be included in the offer. Find out more here!